Hanuman consoled Vibhishana a great deal. He said, "Vibhishana! Rama heeds only the heart; He will not be affected by family affiliations, religious affinities, or Sadhana attainments. He is pleased best by feelings and their purity. He will bless you for the loftiness of your ideals and the cleanliness of your daily life. He will grant you the Darsan you are yearning for; do not grieve. Why, you can take me as the best proof for what I am saying about His compassion and grace. I am a monkey; waywardness is the hall-mark of my tribe; the word 'monkey' has become a by-word for a prankish, playful, petty mind. I am not versed at all in the Sastras. As for asceticism, I have no idea what it means. I have not repeated, according to prescribed rules, the Name of God, nor have I gone on pilgrimages seeking holy rivers! How then has Rama blessed me? Because He heeds only the Love that animates and the feelings that activate people. In your case also, He will pay attention only to the Purity of Feelings. Be confident, do not doubt." Relieved by these words, Vibhishana informed Hanuman details of how Sita was brought to Lanka. 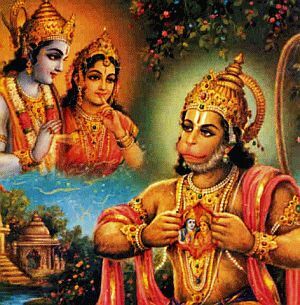 Hanuman refused to partake of any food or drink, since he had resolved to refrain from both until he could see Sita and communicate to her the message of Rama. He was eager to renew the search without delay. But, Vibhishana advised him to proceed cautiously and slowly, and inform himself of the strength and weakness of Ravana's Empire before he left. He himself acquainted him with these points in some detail. Thereafter, he permitted Hanuman to leave on his errand. Hanuman was so delighted to learn that Sita was in Lanka that he actually forgot to ask where she actually was! He entered many mansions to find out whether she was anywhere therein. He saw bevies of women, fallen on their beds, intoxicated by drink and dance, and floored by the banalities of luxury. Keeping in mind the characteristics and excellences of Sita that Rama had described to him, he observed closely every woman in those houses; but he could not meet Sita. In near despair, he jumped on the peak of a hill and thought over the situation, deeply, for long. "How can I go back to Rama, without completing my mission, meeting Sita and consoling her? Better far to drown in the sea yonder. Alas. Mine is a wasted life. Fie upon it", he said to himself. That very instant, he saw a beautiful garden, trim and green, shining in the distance. Coming down the peak, he realized that since the garden was in a valley surrounded by tall mansions, he could not discover the place from the ground. Not knowing what to do next, he hied fast to the house of Vibhishana and discovered him immersed in reciting the Name of Rama. Seeing Hanuman, Vibhishana rose and approached him in a friendly and pleasing manner. He asked, "Hanuman! Did you see Sita?" Hanuman expressed his disappointment, but, Vibhishana gave him the information. "Hanuman! There is in this City a garden named Asokavana. There, in the midst of terrible and mighty Rakshasas, Sita is kept; my wife and daughter are with her, doing service." He also disclosed to him the route by which he could reach the garden and the spot. Hanuman could not stay a moment longer; he reached the garden in a trice. Those who saw him began shouting and accosting, for, his figure was strange and peculiar to them. Noticing this, Hanuman felt that his figure was making him too prominent and public, and so he assumed a diminutive size. Jumping unnoticed from branch to branch, hiding himself behind clusters of leaves, he reached the Asokavana. There he saw a woman, sitting under a tree, weak and worn, through want of food and sleep. The fierce Rakshasas sitting guard around her were threatening her, to change her will and to break her determination. Meanwhile, a grand cavalcade neared the place heralded by the beating of drums and the blowing of trumpets. Behind them Hanuman could see a royal personage, bejeweled and be-robed in magnificent style. Hundreds of maidens followed him, carrying plates full of jewels, sweet and fragrant presents and soft silks. Ensconcing himself within the green shade of leaves, Hanuman watched the scene from the top of a nearby tree. It was Ravana, evidently, for, he pleaded before Sita and prayed to her that she might offer her love to him. He tried to extract a promise by threats of cruel punishment. Hanuman heard him exhort those around him to inflict pain and injury on her. That frail feeble woman did not raise her eyes towards Ravana even once during all the tirade. She only said, "Fool! Vile vicious fellow! Rama alone has rights over me: no one other than Rama has any. I shall reduce this body to ashes in the flames of sorrow at separation from Him. I shall never stray from my resolve. Believe in this and beware!" Hanuman heard these emphatic words and realized that the woman was Sita and no other. His mind gained peace and calmness when he knew this. Very soon, Ravana stung by disappointment and angry at the discomfiture, became even more violent in speech. He gave her a month's respite, to think over and accede. The cavalcade and the maids with the plates also accompanied him out of the garden. When they had all left, Sita raised her head towards the heavens and sighed; "Rama! Has not compassion yet entered your heart? Why have you condemned me to this torture? When am I to be freed from this? ", and she burst into weeping. A Rakshasi named Thrijata was one of the warders of Sita; she was deeply attached to the Lotus Feet of Rama; she was a pious devotee, who had both worldly wisdom and spiritual experience. She spoke to her companions keeping watch over Sita, "Comrades! Last night, I had a dream, which I must relate to you. But, first, let us serve and revere Sita and win her grace. For, listen to the story that revealed itself to me in my dream. A monkey entered Lanka, slaughtered the Rakshasas and set the city on fire! Ravana had no clothes on; he was riding, of all animals, a donkey and moving fast in the southerly direction. And, his head, I noticed, was shaven close. Besides, I found that his arms were severed from the body. Vibhishana was crowned the emperor of Lanka. Throughout the length and breadth of the land, the name of Rama was resounding. Then Rama sent for Sita. Sisters of the Rakshasa clan! Take note. I never get dreams. I haven't seen any so far. So if I dream at all, know it will certainly come true; it will happen just as in the dream. Moreover, the realization, in actual fact, of this dream will not take long; things must happen just as I dreamt, within four or five days." The Rakshasa women were amazed at the revelation; they forthwith prostrated at the feet of Sita and silently resumed their routine duties. Seeing the behaviour of Thrijata, Sita addressed her, "Thrijata! Rama Himself must have sent you here to be one of this group that is around me. Truly, it is because there are a few women like you in this Lanka that unfortunate persons like me are able to sustain our chastity and virtue. Or else, what will be the fate of women like me? You heard, didn't you, the expressions Ravana used just now? He has given a month's respite. If Rama does not come within that month, I, or, rather, this body, will be cut to pieces and it will be plucked and eaten by vultures and crows. Being the consort of Rama, I can never tolerate that horrid fate for this body. Tell me some plan through which I can get rid of this body sooner." Hanuman heard these words from the branch of the tree; he was overcome by sorrow, when Sita spoke in that strain of despair. At this, Thrijata fell at Sita's Feet, and assured her, "Mother! Do not lose hope, Rama is no ordinary being. His might and majesty are unequalled. It will ever be so. You are certain to be saved by him. He will arrive very soon and hold your hand in his. Do not lose courage." She consoled her by loving words and left for home. Availing himself of this chance, Hanuman jumped from his perch to a lower branch; he dropped right before Sita the ring that was given by Rama; it fell shining like a flame of purest ray. And, he kept on repeating "Rama! Rama" in ecstatic bliss. When her eyes fell upon the ring, Sita was astonished at what she saw. "Is this true, or, am I dreaming? Can it be true? How can this golden ring worn on the golden finger of my Lord be found in Lanka? Is this Rakshasa magic or mere hallucination? ... No. I should not hesitate any longer, even after recognizing it as my Lord's to take it in my hand. It will be a sin if I refrain from handling it." So saying, she took it and placed it on her eyes in reverence. Tears of gratitude flowed from her eyes. "Rama! Are you granting me your Darsan, the joy of your presence through this ring?" she said and raised her head. There she saw a small monkey sitting on a branch of the tree and reciting in deep devotion, "Rama, "Rama", continuously. In a flash, she remembered the incidents in Thrijata's dream as related by her. "Ah! Good days seem to be fast approaching. For ten long months, I have not heard the name of Rama pronounced in this Lanka. 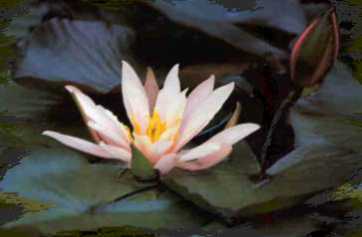 This day, I am able to see a living being reciting that holy name. I also received the dearly loved ring of my Lord," she exulted. She could not keep her joyful excitement down. Sita, who had not talked to any stranger for long, looked at the monkey-form and addressed it thus: "O monkey! Who are you? Wherefrom is this ring?" She could not put full trust in the monkey, for, she had been deceived for months by tricks of impersonation. She interrogated the monkey in various ways in order to verify his credentials. Off and on, she would ask the monkey about the welfare of Rama and at the very thought of His being alone, in the forest, tears would flow profusely from her eyes. Sita swung alternately between joy and grief. Hanuman watched her plight; he could not keep away from her the bond of love and loyalty that was holding him on to Rama. He related the dynastic story of Rama and His exploits, as well as his own story until he met Rama. When she listened to that story, she felt as happy as when Rama stood before her; she could picture Rama standing beside her at Ayodhya and in the forest retreats; she felt so thrilled that she forgot herself and her condition. Soon, she recovered consciousness and knew where she was. She said, "O Monkey! I am glad you told me all this; but, let me ask one question: How were you able to enter this heavily guarded city, in spite of your being only a weak little monkey? How could you escape being caught by these Rakshasas and succeed in spotting out this place and coming to me?" Hanuman replied, "Mother! What skill and strength have I? I am the servant of Rama, His slave. He makes me do everything He wants or likes. Without Him, I cannot survive even a moment. I am a doll in His hands. I play as He pulls the strings; I have no will of my own." Then, Hanuman elaborated on the glory of Rama and manifested his devotion and dedication in the most impressive manner. It was most thrilling to hear those words of his. Rama had told Hanuman for communication to Sita some incidents which no one else knew. He had said, "It may so happen that Sita may not believe your words; she may doubt your genuineness. Then, you can remind her of these events, which are known only to her and me." So, Hanuman began relating those special incidents. "Mother Sita! He has asked me to tell you of the attempts made by the wicked Crow to cause injury to you and of His attempt to save you and to kill that demon." At this, Sita wept aloud, saying "Hanuman! Why is Rama who was so kind to me then delaying to release me from this torture? Rama is the ocean of mercy. Yes. But why has he become so hard-hearted at my fate? No. No. I am wrong. Rama is the embodiment of compassion. He has to play a role that involves all this apparent hard-heartedness, that is all. Hanuman! You are no ordinary individual! For, Rama will not associate Himself so close with ordinary individuals. Nor will He send His ring with inferior persons. How fortunate you are to be His messenger! Show me once your full stature and form." Then, Hanuman landed on the ground and stood before Sita with palms folded in adoration. When Sita saw him growing into a huge and terror-inducing size, she half suspected it to be some demonic trick; she closed her eyes and turned aside! Realizing her fear and the suspicion that was at the basis of that fear, Hanuman said, "Mother! I am neither Ravana nor any one of his devilish Rakshasas. I am the faithful servant of Rama with the pure sacred body of unequalled splendour. He is the very breath of my existence; believe me, I am speaking the Truth. Guessing that you may not have faith in my being His authentic messenger, He took off His finger this golden ring and placed it in my hands to be given to you. With me, there came Jambavan, Neela, Angada and thousands of others of extraordinary heroism. But, I alone was able to cross the ocean through the Grace of Rama. The others are all on the other shore. We were able to hear from Jatayu [RRV-3b] and Sabari [RRV-3b] the story of your having been brought here by this villainous Rakshasa King. When we came to know three days ago from Sampathi news confirming your being here, we felt as happy as when seeing you before our eyes. Rama and Lakshmana are awaiting my return with the good tidings. If you permit me, I shall get back immediately and communicate to them news about your welfare." Sita pleaded, "Hanuman! I do not know whether you will be back at this place or when. Please stay for a day more and delight me, by telling me about Rama and Lakshmana." But, since the demonesses gathered around in groups to carry out their separate assignments Hanuman resumed his miniature size and hopped on to a branch of the tree. Sita sat under the tree, ruminating on all that Hanuman had related to her; she derived delight while doing so, and she cast her eyes showering benediction on Hanuman sitting on the branch above her head. That day, she had no thirst or hunger; she did not touch the fruits and drinks that the women-guards brought for her; her pathetic condition hurt the kind heart of Hanuman. She appeared to him as the very picture of misery. Hanuman heard the harsh and sharp-pointed words used by the women-guards, and he gnashed his teeth in anger, for, he could not deal with them as he wished to; Sita alone could give him orders what to do. After some time, Sarama, the wife of Vibhishana and her daughter, Thrijata, came to the tree and fell at the feet of Sita sitting disconsolate thereunder. They enquired about her health. Since they were partial towards her, Sita spoke to them about how the dream of Thrijata had come true, and how a monkey had actually entered Lanka in accordance with it. Sarama and Thrijata showed extreme enthusiasm and excitement when they heard the account of what had happened; they plied Sita with questions, in their eagerness to know all details. Sita showed them the monkey perched on the branch and the Ring it had brought. They both pressed the ring on their eyes in reverent adoration. Hanuman was watching for an opportunity to see Sita while alone and very soon he got it. Hanuman jumped to the ground and whispered to Sita 'Mother! Do not be anxious and grief-stricken. Sit on my back, and I will transport you in a trice to where Rama and Lakshmana are awaiting news about you." Hanuman pleaded in many ways for acceptance of this plan. Sita replied, "Hanuman! I am indeed very glad to hear you speak thus. I am sunk and struggling in the sorrow of separation; your sweet words give me solace like a boat on a stormy sea. But, do you not know that I will never contact a person other than my Lord? How then can I sit on your back; consider that." These words of Sita were a sharp repartee which hit Hanuman in the heart and exposed his pettiness and pride for having suggested a dishonourable step. But, Hanuman recovered soon and said, "Mother! Am I not your son? What is wrong when the son carries the mother on his back? What evil consequence can follow from that?" He supported his idea with various pleadings and points. In reply, Sita declared, "Hanuman! Of course, for me and for you, the feelings of mother and son are real; but, imagine what the world will think of it. We have to consider that aspect, also, haven't we? We must so live that we are ideals for the lives of others. We should not draw upon ourselves by our acts the ridicule, contempt or condemnation of others; no one should point the finger of scorn at us. And, above all, we must derive self-satisfaction, as a result of our acts. When I know I cannot derive that satisfaction I will never attempt such acts. Even if my life departs, I don't need or crave for another's assistance. "Moreover, my Rama has to destroy this vile demon who tortures me; He is the person who has to discharge the responsibility, no one else can. He must come himself into this Lanka, kill this Ravana, and lead this Sita back holding her in His hand - that is the sign of the true hero that He is. That is the sign of genuine valour. Look at this Ravana; he came like a thief in a false form and stole me from my Lord. But, Rama is the embodiment of Righteousness; he observes the norms of right behaviour. He honours the spoken word. When news spreads that this Rama sent a monkey and brought away Sita without the knowledge of Ravana, it would be dishonouring him. Getting out of here in the way you suggest will surely be treason. We should not resort to mean stratagems. We should guard the fair name of Rama as our very breath. His fame is the deity we adore in our hearts. We have to preserve it unimpaired by thought, word and deed. Your proposal has not given me satisfaction for this reason". Hanuman admired her untarnishable virtue and her steadfast adoration of her Lord, and the loftiness of the ideals she maintained. He extolled her in his mind and recollected her words, in order to draw inspiration therefrom. He said, "Mother! Pardon me. Since I saw with my own eyes the tortures you are undergoing and the pangs of separation which Rama is suffering, I entertained this idea to take you as quickly as possible to the Lotus Feet of the Lord. Pardon me if it was wrong", and fell at her feet, again and again, in great remorse. At this, Sita questioned him many times on the condition of Rama and Lakshmana and how they were faring in the forest. "Why worry about men? They can bear any burden or travail. They can bear separation from women with fortitude. Women suffer most, for, it is terror for the wives to live apart from their husbands." Hanuman told her, "Mother! Rama and Lakshmana are keeping well, of course; but, do not compare them with ordinary males. It is not fair. Alas! Every moment, Rama is spending in thoughts of you and of separation from you, and so, He is not paying heed to either thirst or hunger. He does not eat or drink, unless pressed lovingly by Lakshmana to partake of a few fruits or a little drink. I do not remember a single occasion on which Rama drank a gulp of water on His own initiative. Do not be under the impression that they have forgotten you or are neglecting you. "Lakshmana is spending his days watching over Rama as the lids guard the eye; he is the breath of the Breath of Rama; he is overcome by the agony of separation from you and of witnessing the anguish of his brother; he has become a rock, unaffected by any feeling other than concern for Rama. He is the source of courage and sustenance that is unfailing and full. He has not slept these ten months, nor has he taken food." When Hanuman was describing the pathetic condition of the brothers, Sita acted as if she was amazed at the love and affection that Rama had towards her. Again and again, she said, "Yes. You too describe only the misery of the men; what do you know, how can you gauge the sorrows of women?" She pretended not to believe all that Hanuman related to her! She watched Hanuman and appreciated his wisdom and powers; she recalled the story of how Rama and Hanuman had met and came to be bound in love and loyalty, and derived great joy and content therefrom. At last, she got firm faith in Hanuman and his mission. Again and again, Hanuman pleaded, "Mother! Why this feeling of separateness? Why spend days and months in agony and pain? Please sit on my back and I shall take you in a trice to the Presence of Rama." Sita noted the anxiety of Hanuman to win his point in spite of her arguments, moral and spiritual, legal and worldly; she decided therefore to stop further conversation on this score by a sharp repartee. She said, "Hanuman! Are you or are you not one who obeys strictly the commands of Rama?" Hanuman replied, "Yes. I would rather give up my life than go against the commands of Rama or disobey His orders." He banged his chest with his fist in order to lend emphasis to his declaration. "Well. Consider this. Did Rama command you to seek me out and bring him information about where I am after seeing me, or, did He ask you to bring me with you?" Hanuman was rendered dumb by this question. He could not continue his pleadings. He said, "Mother! I did not think so deep into the consequences of my proposal. I ask pardon again." From that moment, he never broached that matter.